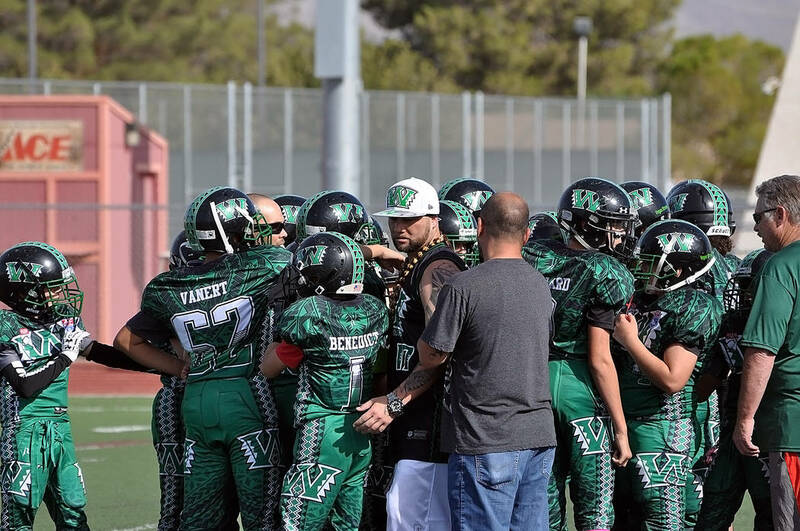 The Pahrump Valley Warriors knew they were in for a tough game in the National Youth Sports Nevada 13U semifinals Oct. 27 at Trojan Field. Horace Langford Jr./Pahrump Valley Times Coach Cameron Batangbacal, center, talks to his Pahrump Valley Warriors before the start of their playoff game against the North Las Vegas Mustangs on Oct. 27 at Trojan Field. Horace Langford Jr./Pahrump Valley Times Maurice Murray of the Pahrump Valley Warriors looks for room against the North Las Vegas Mustangs during an Oct. 27 playoff game in Pahrump. The Mustangs won 19-0. 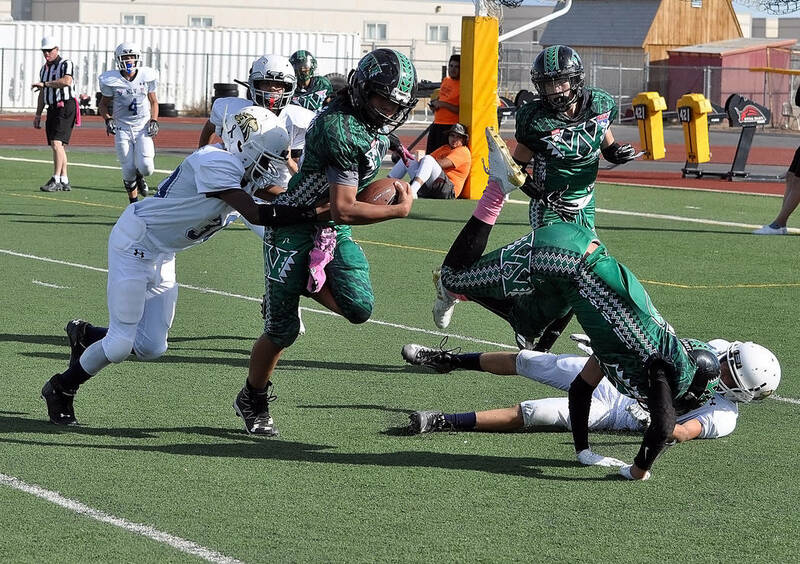 Horace Langford Jr./Pahrump Valley Times The Pahrump Valley Warriors' defense closes in on a North Las Vegas Mustangs runner during the Mustangs' 19-0 win in their U13 playoff game Oct. 27 at Trojan Field. 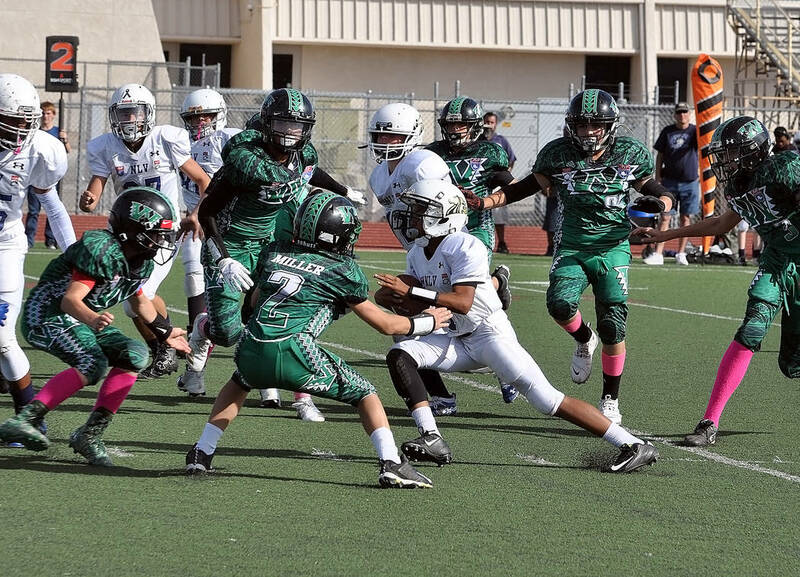 The North Las Vegas Mustangs had handed the Warriors one of their two losses during the season, and they had a big back in Jacquieze Holland, and they were allowing fewer than 10 points per game. The Warriors did a great job holding Holland in check for most of the game, but they couldn’t get much going against the Mustangs defense and lost 19-0. Warriors coach Cameron Batongbacal had high praise for his players for the way they played on defense, especially against Holland. The Mustangs rode Holland to their first touchdown, but it took a lot of work. They needed 12 plays to go 49 yards, converting on third down twice and fourth down once, before Holland scored from 2 yards out. He carried nine times on the drive for 28 yards. And that was it for the rest of the half, partially thanks to the Warriors stuffing Holland on fourth-and-goal from their own 1. And when Jose Mendoza rambled 34 yards, finally chased down by — who else? — Holland, the Warriors had a scoring threat of their own. But the Mustangs, who made a habit of blowing up sweeps, nailed Zachary Wilkerson for a 9-yard loss and the drive quickly stalled. The Mustangs followed that with their best drive of the day, motoring 71 yards on just six plays, with Holland scoring on a 5-yard run to make it 13-0. It would be 19-0 early in the fourth when Holland took a swing pass, spun away from a would-be tackler and raced 25 yards to the end zone. But the Warriors didn’t quit, and Mendoza carried six times for 25 yards on the ensuing possession that reached to the Mustangs’ 15. But a fourth-down pass was intercepted to end the threat. Mendoza finished with 77 rushing yards out of 99 total yards for the Warriors. Holland totaled 81 yards rushing, well below his usual numbers. Afterward, Batongbacal couldn’t say enough about his players. “If they didn’t give it all they had today, then hang your head, but they gave it all, so heads up high,” he said. “I told them that I love them, they’re young in life and they have high school ahead of them. It doesn’t stop here. “High school is going to look very promising. They’re already good, but they’re going to be even better as the years go by. And that’s the goal. I know I’m a stepping stone for (Pahrump Valley High School) coach (Joe) Clayton. That’s what I’m trying to do. I try to implement the offense so that when they get up there they’re up to speed. And while next year will bring a lot of new faces to the 13U team, this year’s edition was special for their coach. 9U Pahrump Valley Junior Trojans: Zach Dockter, Noah Amaya, Cade Wulfenstein, Kelsen Cross-Smith. 11U Pahrump Valley Junior Trojans: kayne Horibe, Ethen Hutchinson, Garfield Griffith, Cory O’Neal. 13U Pahrump Valley Warriors: Jose Mendoza, Maurice Murray, Zachary Wilkerson, Aiden McClard.